â&#x20AC;˘ It is the right of each and every child to receive good education. Every parent wants to find the best organization for his or her child where the child not only receives academic knowledge, but also is able to become a person who can take decisions in life and face difficult situations with strength, coming out as a winner at the end. â&#x20AC;˘ Diamond Bar Montessori Academy is a school located in Diamond Bar, California, USA. It can be distinguished into: preschool for the infants and toddlers and elementary-middle school. The school is built on the foundation of the principles of independence and innovation and believes in giving to its students a caring and knowledge gaining environment. For effective Child Care Diamond Bar, CA offers a good location for setting up a school. â&#x20AC;˘ Various educational programs offered â&#x20AC;˘ The school provides infant program for kids of ages 6 weeks to 24 months. Similarly, it has other different programs for kids of different age groups that are pre-primary, primary, advance primary, trans-kindergarten, kindergarten, elementary years and middle school. The children are given education in accordance with their ages. Montessori Preschool, Diamond Bar is responsible for handling the infants and toddlers. â&#x20AC;˘ Infants are provided sensory, language, cognitive and motor activities and pre-primary kids are given toilet training as well! For the students of elementary years, the teachers focus on their literacy development. In case of the middle school students, there is focus on essay-writing work andon increasing self-awareness. Other programs for enrichment • A number of enrichment programs are being introduced in the curriculum. These include activities like Zumba, contemporary dance, working on computers, arts and crafts, language development, ballet and yoga for children. There is focus on getting the children into all kinds of extra-curricular activities for the overall development. Sports is also one of the most important aspects of life, so soccer and chess are another activities that are included in the program. Then they are taught science and indulged into the STEM-Program consisting of science, technology, engineering and math. The Montessori Preschool, Diamond Bar, CA organizes special programs for the least aged kids. • The students are given an extraordinary atmosphere where there is learning with fun. And it won’t be wrong to say that for giving good development and Child Care Diamond Bar, California’s Diamond Bar Montessori Academy is the right place. Facilities for the students • The school provides all the major and minor facilities to give a warm, comfortable and safe environment to its students. It is careful in providing good and spacious classrooms, proper and clean washrooms, library with a huge number of interesting and knowledge containing books and playgrounds with various sports facilities. • It’s worth mentioning that it also has a science center that keeps animals from different parts of the world. There are geologic center, geographic center and nature centers. These contain exciting and adventurous things like rocks from different time periods. All this enables the students to get practical knowledge at the same time. • The location Pomona, Diamond Bar, California is a safe and preferred place for schools and provides good environment to the schools. Its environment helps the school to provide those facilities to the students in an effective way. Montessori Preschool, Diamond Bar offers facilities to the toddlers as per their age. Teachers â&#x20AC;˘ In spite of all the facilities that a school can give to the students, one of the most important role is played by the teachers in their lives. The teachings of the respective teachers remain with the students forever. A bond is created between them that can be ever-lasting. 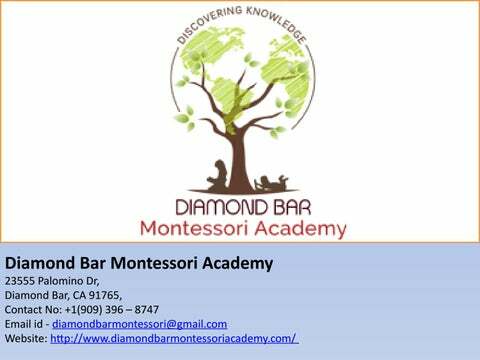 So the Diamond Bar Montessori Academy employees teachers who are experienced and qualified. They are dedicated towards their work. They are loving and caring at the same time and give individual attention and motivation to their students. â&#x20AC;˘ The school gets its teachers finger-printed and also screened by the Department of Justice, the FBI and the Child Abuse Registry. To give good Child Care Diamond Bar, Californiaâ&#x20AC;&#x2122;s Primanti Montessori takes all care in keeping efficient teachers. Organization of summer camps and tours • The academy has organized successful camps for the primary as well as elementary students. The primary summer camps were held in the months of June, July and August. Here a lot of learning activities were carried out which include washing away oil, making a model of volcano, creation of movement in water and many more. Field trips were carried out. Primary school summer camps were also carried out in the same months of the year 2018. These students got the chance of being a part of field trips, botany related activities, creative writing and cooking projects to name a few. • These teach students punctuality. They were pre-informed about the requirements of the camps. • The school gives an opportunity to the parents of the students of the school to make a visit to the school and get a personalized tour during which they meet the teachers, have a look at the school campus, explore the programs and see the classrooms. They can schedule this tour by visiting the website of the school, filling the required details like the child’s name and the date of visit and sending the same to them. Fee details of the academy • The registration charges are $100. • For further details, one needs to contact the academy on call. They will be informed about the special promotional rates and all other details and queries at the same time. • It needs to be mentioned here, that the school has student to teacher ratios higher than the standard ratios. The students are provided lunch and snacks free of cost as the authority believes in building a healthy relationship between children and food. For this purpose, they keep their own chef who can cook food from all over the world to develop the students’ interest in all varying cultures. • The school holds each and every child in it equally important. It has more than the basic facilities needed in a school. 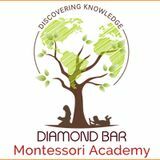 The Diamond Bar Montessori Academy makes sure it always encourages the students to live a good life, build a successful career and make parents proud.